The fan-base for the New York Giants is on a Saquon Barkley craze, and rightfully so as he posted incredible NFL combine numbers; running the 40-yard dash faster (4.41) than Odell Beckham Jr. and jumping higher (41 inches) than Julio Jones. Barkley clocked in at 233-pounds of pure muscle, making him one of the draft’s heaviest running backs. But the consensus is that Barkley might be on short list for the Cleveland Browns at No. 1 overall, so realistically, we must evaluate the other running back talent in the draft. "He does remind me of @A_Kamara6." Michel is believed to be the second-best back in the league behind Barkley, after averaging 7.9 yards per carry in 2017 and recording 1,227 yards with 16 touchdowns. The Georgia product is a workhorse back. In the NFL, we should expect to see him handling a full load. Michel could fall to the second-round and land with the Giants at No. 34 overall if they can’t secure Barkely int he first. Averaging 5.3 yards per carry in 2017, Guice is among the nations best running backs. He additionally totaled 1,251 yards and 11 touchdowns. Drafting Guice would add a power runner to the mix for the Giants; a player with good instincts and ability with the ball in his hands. If drafted in the second-round, he could be a workhorse back for the Giants in 2018. 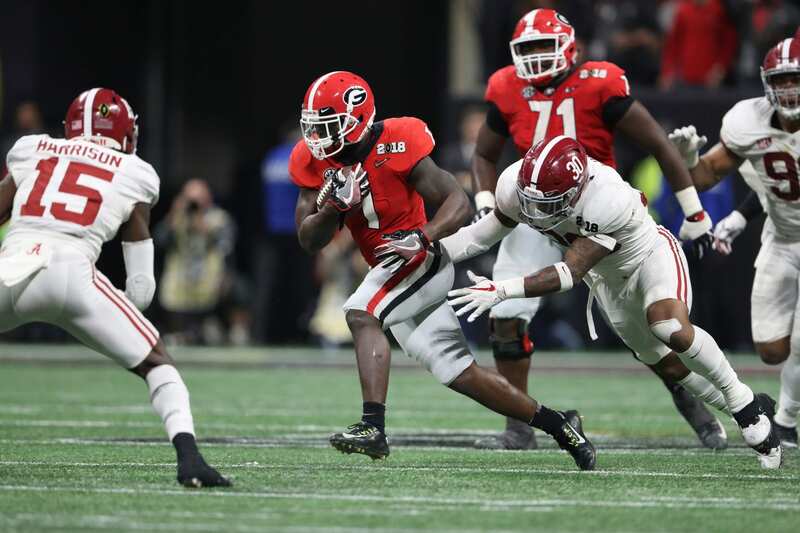 Splitting carries with Sony Michel at Georgia was Nick Chubb; a physical back with tackle-breaking abilities. He averaged 6 yards per carry in 2017 for 1,345 with 15 touchdowns. If Michel wasn’t stealing the spotlight from Chubb, he may have seen much improved stock going into the combine. He could be a solid scoop for the Giants in the third-round if he falls.